I really appreciate the work you did in putting this together and making it so much fun for the kids. I will be on the lookout for all your future apps!! Love both stack the countries and stack the states. My 5 year old can place every country in the world and he wouldn’t be doing that without the app. If I could make one suggestion: it would be nice if the name of the country was said aloud when it comes up. My son doesn’t read well yet and I he is basing everything on shape and color which is still great. Also, if you could add a game to the stack the states where you could place the states in their proper place like in stack the countries. Thanks and keep up the great work. Hi. My 5 year old and I love this app! Quick question, Western Sahara is considered an occupied territory: is this why you did not include it on the map of Africa? I played this game on a friends Iphone and fell in love with it immediately. As soon as I could I bought Stack the Countries and Stack the states on my Windows phone X8. But now both apps cannot be launched :(. It just redirects me to the start screen of the phone. Isn’t it playable on a windows phone perhaps? Our 3 1/2 year old has mastered both stack the states and stack the countries. It took him about two weeks of occasional play to get all the countries, and he can name the countries in pile up as they are dropping. We are in awe of his ability… He did ask if there was a ‘stack the seas’ app… So when you have some free time we would love to see a continuation of this great series 🙂 Thanks! We would like a number of kids to play with this. Is it possible/easy to reset so each child can start from the beginning? We will want a number of kids using this. Is it possible/easy to reset it to the beginning for each child? We loved your games. I did want to say that it seems your “Stack the Countries” is based on the Mercator Projection, which makes things farther from the equator seem larger than things closer. I would love for my kids to get a better sense of the relative size of the countries. (Especially since they are so focused on the size so they can pass that line)? Hi Lyn! Thanks for your note and I’m very pleased that you have enjoyed my games. It’s been a little while since I first created Stack the States, so I did a little research. After looking at actual mercator projection maps, the maps from Stack the Countries don’t appear to be quite so exaggerated. Have a look at this comparison: http://freecloud.com/dl/STCMercator.jpg. You’ll see my map of North America from Stack the Countries on the left doesn’t stretch quite like the actual mercator map. 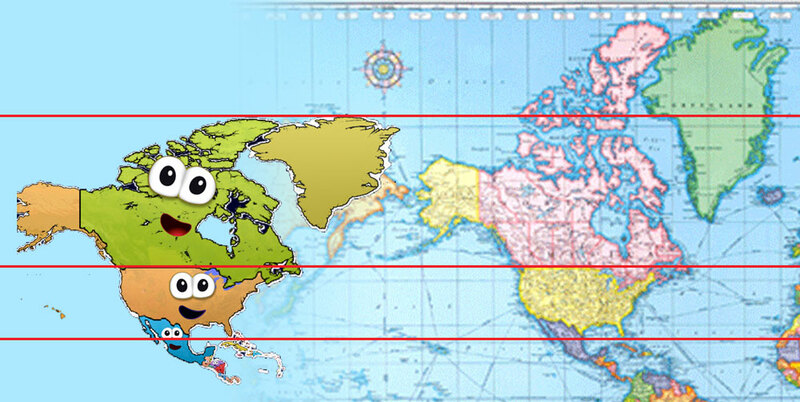 I actually had to stretch my map’s image vertically by 160% to get Canada’s height to match the mercator projection. You can also so that Greenland on my map is only half the height of Greenland on the mercator projection map. Having said that, I did have to fudge some of the sizes of the countries in the game due to the shear range of sizes from the smallest to the largest. I had to artificially increase the size of some of the smallest countries such as Monaco and Andorra, otherwise they might be only a pixel in size. Likewise, I had to scale down some of the massive countries such as Russia, Canada, Brazil, etc. otherwise they might display at twice the size of the screen. Despite these adjustments, I believe the overall scale of each country is still conveyed to the player. Just checked the Mac OSX App store and found this app there. Bought it immediately! There is a classroom full of 7th graders who will be quite happy that you made this app. Thanks for your hard work getting it ported to so many platforms. Are you not making STC for Mac anymore?? Kosovo, Vatican City, Taiwan, Palestine, & Western Sahara are all taken up by empty space! Also, could you add an Easter egg where former countries could be collected? Like USSR, Korea, Yugoslavia, Czechoslovakia, or East & West Germany? We home school and as part of our 7th grade work, or kids memorize the entire world map. Is “Stack the Countries” available for our MacBook Pro computer? Somehow we have “Stack the States” from years ago (my oldest fell in love with that program about eight to tens years ago as a five year old and we got it on everything we had). Thanks so much for your hard work. Hello Courtney. Thanks for your note and for being such a loyal customer! At one time, Stack the Countries was available on the Mac. I have since removed all apps from the Mac App Store in an effort to simplify my business. My main focus is now on mobile devices (phones and tablets). All the best, Dan. How do you change the language on Stack the Countries? How do I get stack the states to read aloud the questions to my 5 yr d? Hi Brooke. Thanks for your note and for your interest in Stack the States. The read aloud feature has been included in the new version – Stack the States 2. I hope this helps! Hi, I’ve been playing Stack the States, Stack the States 2, and Stack the Countries. I really enjoy Stack the States 2 because the states and backgrounds are 3D, and I think it’s pretty cool that when you stack the states, if you get a state and other state that borders the state it will connect them. I think you should make a Stack the Countries 2, which would have the same concepts as Stack the States 2 but with Countries. I think you should be able to connect the Countries like in Stack the States 2.